I have to admit, and give credit where it’s due, that when it comes to cooking the perfect soft boiled eggs in this household, no one does it better than Matt. Yes, he can cook! Although, apart from this other time when I was sick and he penned this post, he leaves most of the business of nourishing our family to me. Thanks honey, I do appreciate both. Perhaps it’s a remnant of his learnings from Ziggy Zen’s A cookbook for a man who probably only owns one saucepan or maybe he’s always had it in him, who knows? Whatever it is, the resulting eggs are amazing! Now that I’ve stolen his secret soft boiled egg recipe (shhh), I’m going to share it with you because the eggs are to die for: soft, runny yolks enveloped in whites that are just set. Pure Sunday morning’s breakfast indulgence. And a super healthy one at that. 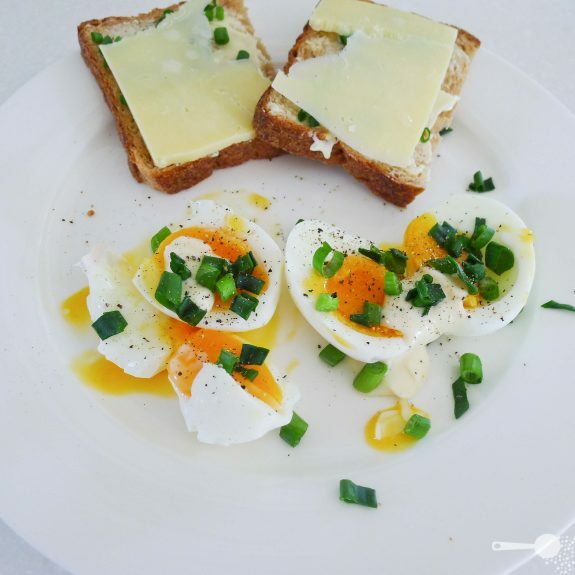 I like to top my perfect oozy soft boiled eggs with a little mayo and chopped chives and consume with a handsome hunk of sourdough bread topped with a shaved slice of cheese. You will need some eggs (duh) - however many eggs you need and can comfortably fit on the bottom of a saucepan, and a kitchen timer or stop watch for this. 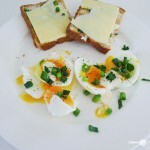 Precision in timing is key to runny yolks. I like to cook around 6 of these at a time and keep them in the fridge to top salads, add to laksa or simply snack on. Please note that for induction cooktops you may need to extend cooking time by 30 seconds. Place eggs gently into the saucepan and cover with cold water. Place over medium heat. Let the water reach boiling point at which time you will see bubbles forming on the bottom. Once most of the bubbles start floating to the surface, set your timer for exactly 3 minutes. When the time is up drain the hot water and place the pot and eggs under cold running water for a minute to stop the cooking process. Remove from pot and peel eggs or place in the fridge unpeeled for upto 4 days to use later. This photo looks so delicious! It is making me so hungry just looking at it! I hope you enjoyed it 🙂 making me hungry now too! Photograph seems yummy and delicious…. Thank you for teaching us so simple recipe.